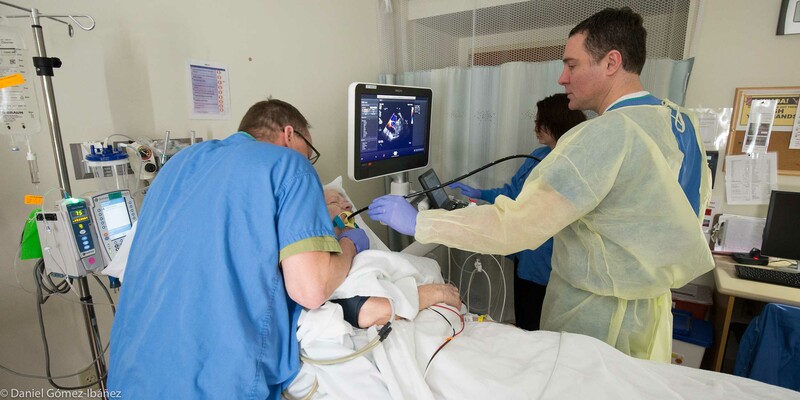 Dr Benjamin Kleiber guides the Doppler probe during Mrs Mary Jean McGrath's transesophageal echocardiogram. Nurse Larry Larson steadies her jaw and sonographer Tosia Dennis operates the recording console. This story begins in January, 2016, when I met Mrs. Mary Jean McGrath at her first appointment in the Dean & St. Mary’s Cardiac Center in Madison, Wisconsin. Six months later, after photographing all her consultations and procedures, I was invited to join her at her granddaughter’s wedding. From the beginning she had told her doctors that this was an occasion she was determined not to miss. She might well have missed it, had it not been for the transcatheter mitral valve repair (TMVR) that reversed her congestive heart failure. An echocardiogram in June, 2015 had revealed mitral valve regurgitation, and the family became alarmed at her decline over the next months. She was increasingly tired, often short of breath, and would have to pause midway when walking across her living room. Her primary care physician, Dr Adam Balin, later told me that he was ready to discuss end-of-life issues with Mrs McGrath and her family. But when he learned about this relatively new procedure to repair a mitral valve without open-heart surgery, he decided to recommend it to Mary Jean when he saw her in early January. Mary Jean is just as impressive. At ninety years old (she turned ninety-one in August of this year) it's perhaps not surprising that her heart and stamina had begun to fail. But she has a tremendous inner strength; she has never lost the spirit and optimism of a much younger person. 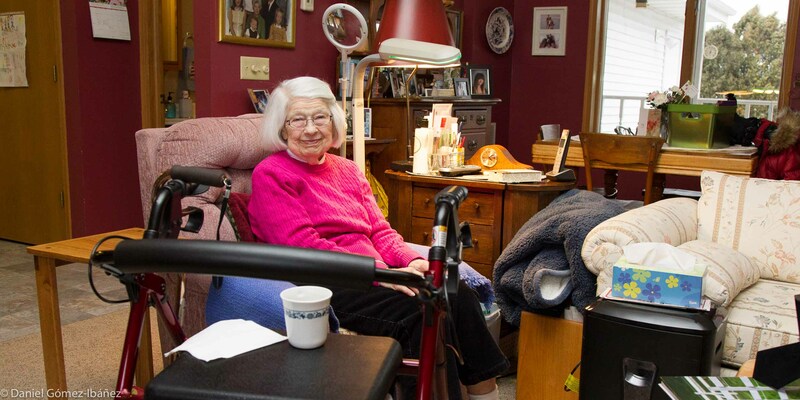 Mary Jean McGrath at home, before her surgery. Her walker is in the foreground; photos of her family crowd the walls. Mary Jean Smith grew up on a farm in Iowa, the oldest of twelve children. During World War II she taught in a rural school and in 1946 she married Bob McGrath after he returned from serving in the Army Air Force. Bob worked as an engineer for Allis Chalmers; Mary Jean became a realtor. They had seven children. 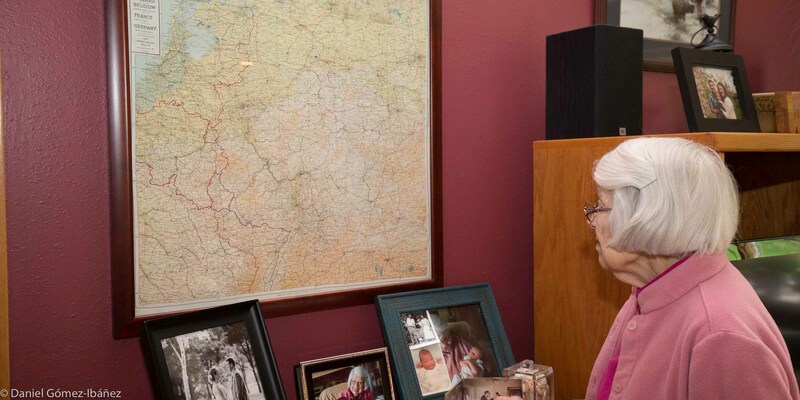 During the second world war Mary Jean taught school in Iowa and helped care for her younger sisters and brothers. She had met her future husband in high school. "Bob was a good man. We didn't talk much about the war, but it was a part of his life. He was an engineer/gunner in B-24 bombers. This was the map he carried in case he had to bail out -- printed on silk, both sides -- you can see from the creases and stains how he carried it folded in his pocket. We got married after he came back, on May 30, 1946." Bob died in 2007. 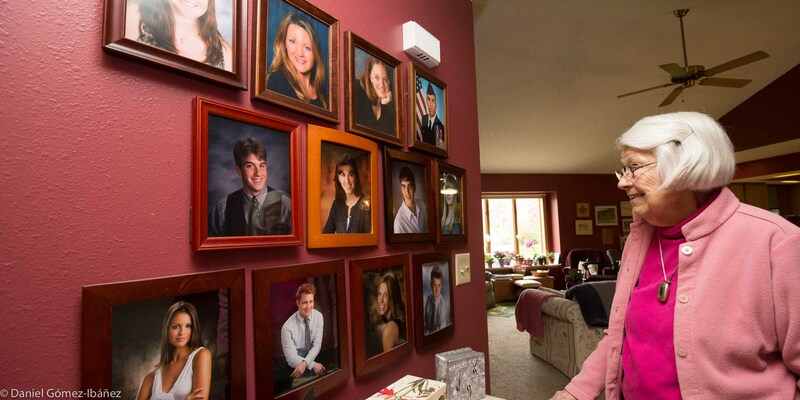 Today Mary Jean lives alone in a spacious home near Madison, Wisconsin, surrounded by photos of a large and loving family. There are eighteen grandchildren and five great-grandchildren. She gets lots of visits. Graduation photos of Mary Jean's grandchildren line the hall leading to her bedroom. Natalie Krumrei (second from the left in the top row) will be married in June, and Mary Jean plans to be at the wedding. It's one of the reasons she wants the mitral valve repair. "I like life! I have plans! I want to be there with Natalie!" I was lucky to have Mary Jean as a subject. At hospital and clinic her cheerfulness and smiles never deserted her. She radiated a positive energy that seemed to lift everyone in the room. We easily became friends. Her family, especially her daughters Nancy, Barb, and Kerry, and her son Kevin, also became friends and always supported my efforts to document their mother’s story. 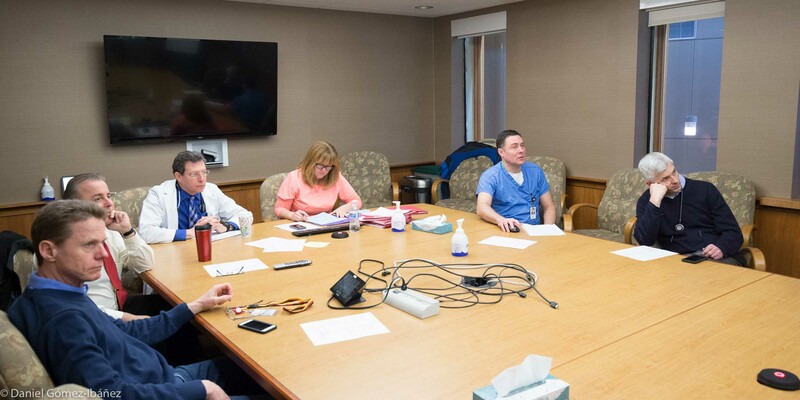 Of course much credit for this project goes to the administrative council, the media and communications department, and the cardiology and surgical staff of the Dean Clinic and St. Mary’s Hospital in Madison, Wisconsin. I wanted to show kindness, caring, and compassion in a series of photographs and I proposed this idea to St. Mary’s because compassion and respect are two of the hospital’s stated values (the others are excellence, stewardship, and community) and because of my own positive experience as a patient there. The hospital approved and the staff welcomed the project. A cardiology nurse, RaeAnn Gray, thought that Mary Jean McGrath would be a good subject, and once Mary Jean and her family agreed, I was given complete and unfettered access to the clinic and hospital visits that followed. In addition to the many persons named in the captions to the photographs, I want to thank Tracy Janczak, Structural Heart Coordinator, Cardiac Center; Mike Bull, Director of Invasive Services, Cardiac Services & Medical Imaging; Valerie Klitzke, Program Development Facilitator, Outpatient Center; and especially Mark Decker, Clinic Manager, Cardiology & Cardiovascular Surgery, who was always ready to answer questions or facilitate my access. Finally, Stacey Wendt-Kaisler, Communications Specialist, because she was always helpful and generous and spent more time on this project than anyone else at the hospital: Thank you, Stacey!